Through his Ryefield Ceramics business, Datz creates and sells his own fine ceramics at regional craft shows. Steve Datz has loved making pottery since he was 6 years old, when a teacher first ignited the creative spark in him. Today, as the owner of Your Creation Station in Middletown, Datz is fanning that spark in other people. Sitting at one of the long tables where customers can create and paint their own pottery, Datz cheerfully traced the long, meandering path he has taken to owning his own business. There have been plenty of detours along the way. As a second grader in East Brunswick, N.J., he had a teacher who was a potter. Pottery was part of the curriculum, and Datz found that he loved the process. His learning continued through middle school, and his high school also offered a pottery program, so Datz was frequently at the wheel, carefully crafting his own work. While his parents supported his interest, "My pottery teacher in high school said it was a very hard way to make a living," Datz recalled, "and that's definitely been proven." 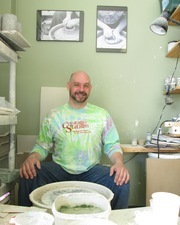 Steve Datz at the potter's wheel in his Middletown business, Your Creation Station. That realization detoured Datz into a series of odd jobs after high school -- cleaning houses, pumping gas, and working as an electrician. "I remember one really hot summer day in July, being up in an attic, talking to another guy who was an electrician too," Datz said. "I realized, 'You know, I might not want to do this forever.'" He knew he wanted to work outdoors, so he figured ecology would be a good college major. He entered the University of Delaware and found out that that ecology and entymology were not the same thing. "They didn't have an ecology program, but they had this thing called Entymology (Applied Ecology)," Datz said. "Two days before classes started, I looked it up in the dictionary and found out that it was the study of insects. I didn't really expect to do well. I was never a good student, but I ended up doing pretty well. I got into a couple of programs, started doing some research with the insects, but about halfway through I found that it wasn't something I wanted to pursue in grad school. "I was never a farmer, and I swore up and down that I'd never be an agricultural extension agent," Datz said. "And then I joined the Peace Corps and was assigned to an agricultural extension office." Datz said that when he signed up, he wrote on the application, "Send me anywhere, I'll do anything." That's how he wound up in Thailand, "doing something I swore I'd never do," he said, laughing. Without speaking a word of Thai, Datz found himself working with farmers, breeding and releasing stink bugs to reduce the region's use of pesticides. This was long before stink bugs made the trip to the United States, Datz said, deflecting any blame for the scourge. "I didn't bring them back," he said, smiling. "That wasn't me at all." Datz learned the dialect spoken by farmers in southern Thailand during his two years of working with the Peace Corps, and when his service was ended, he moved to Bangkok to work with a comunity development program, creating and implementing HIV/AIDS prevention programs and teaching computer science classes at a Bangkok business school for four years. "I found it to be creative," he said. "A lot of it is problem solving. There's also the craftsmanship of it. There's definitely a sense of order in building systems. It's much like building a functional piece of pottery. You have all these little systems working together." While he was in the Peace Corps, he also happened to start a village Little League baseball team, teaching young people the fundementals of the game, starting with only his own ball and glove, and eventually getting equipment and starting tournaments. He came back to the United States in 1997, not intending to stay, "but now it's 17 years later and I'm still here," Datz said. Working in computer programming full-time in the United States, Datz found that the monetary rewards of the work didn't satisfy his creative spirit. "I was going to run a barbeque truck," he said, smiling, and even bought a van for the business. But pottery came back into his life when he bought a wheel and kiln, raising the possibility of making and selling his own pottery, or opening a store where people could create and paint their own ceramics. Customers can use a wide range of glazes to decorate their own artworks. After finding success through selling his work at regional craft shows, Datz expanded his Ryefield Ceramics business two years ago into Your Creation Station, his one-of-a-kind business on Middletown's busy East Main Street. The storefront is lined with cups, platters, vases and pots that can be painted by customers and then fired, resulting in heirloom pieces. There are similar paint-your-own-pottery franchise businesses, Datz said, but what makes his business different is, "I'm a potter, for one thing," he said. "Customers say it's like being in their own living room, doing a craft. We're very laid back." 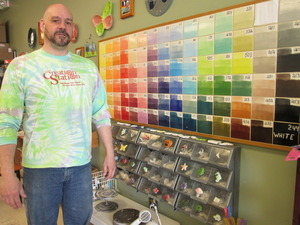 Datz has a staff of three to run things when he can't be at the shop, offering pottery classes, tie-dye projects, fused glass creations and, soon, make-your-own birdhouses. Working with young people, Datz said, is especially rewarding. "Some kids are hesitant about getting their hands dirty," he said, "and some are ready to roll. I tell them if they're not making a mess, they're not doing it right. There's varying degrees of mess. But that's why you come here. You can make the mess and walk away from it." While his own work displays a professional artist's grace and a fine sense of color and design, Datz said the simplistic nature of what newcomers create is fine with him. "I tell parents with younger kids that it's all right, whatever it looks like," he said. "A lot of times, the little kids will hand me something that's a glob with holes all over it. But they'll sit there and explain to me what each hole is for, how this travels through there, that sort of thing. It means different things to different people. "Once they see the process and go through it, it's amazing," Datz continued. "It goes from a lump to whatever you squeezed it into being, then it dries and changes, then it gets fired and it's a different color. Then you paint something else on it that you think is going to look one way, but it doesn't look that way now. Then it comes out shiny, just like you figured it would. I tell people all the time that I've done a lot of really neat things in my life, but making pottery is the coolest thing I know how to do." Datz brings his potter's wheel to daycare centers, group homes, hospitals and centers for people with disabilities, letting them share in the excitement of creativity. "We can adjust the wheel so they can reach, and they make a piece of pottery on the wheel," he said. "We'll do pinch pots a lot of times, but mostly it's using your hands and manipulating the clay. It's a lot of fun and you can see they're very excited to do it. It's very rewarding for me, too." With eight years of business experience behind him with Ryefield Ceramics, Datz said he'd like to unite his own work with Your Creation Station and offer his own ceramics to customers to paint for themselves. "That's the goal for this year, to have more of my mugs and trays available for people to paint," he said. "It's a business, so I want to expand it. I've been thinking about how to manufacture pottery and sell it on a larger scale. I want things to be made here in America. Each piece of my stuff is individually done, so there's only so much that I can make by myself." Datz lives in Pike Creek, Del., with his girlfriend, but puts in long hours at Your Creation Station almost every day. "But it's a blast," he said. "The best part is that it's mine. I never liked people telling me what to do." Your Creation Station is at 478 E. Main St. in Middletown. For more information, call 302-464-1044 or visit www.yourcreationstation.com.